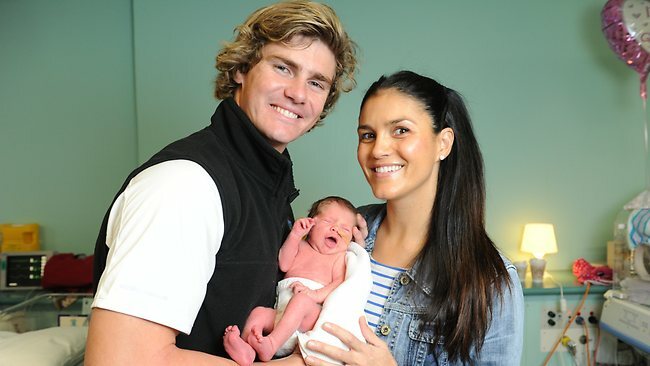 Rugby union player Berrick Barnes, and his wife Bec, welcomed their first child on June 16, and have named their son Archie. Archie Barnes was born six weeks premature, and weighed just 1.92 kg (about 4 pounds 4 ounces). Berrick and Bec knew that he would be early, but the fact that all their baby stuff is still in its wrappings tells you that Archie came even earlier than expected. Berrick began his sporting career straight out of school, when he joined the Brisbane Broncos in the National Rugby League in 2005. He then switched codes the next year, and began playing for the Queensland Reds; he has been with the NSW Waratahs since 2010. He made his debut for the national team, the Wallabies, in 2007. Rebekah (nee Spratt) and Berrick were married in the regional New South Wales city of Orange, shortly before Christmas last year. June 16 was a very memorable day for Berrick. He had been in Melbourne the day before preparing for a Test match when he was unexpectedly called back to Sydney for the birth of his son. Archie was born around midnight, and then Berrick had to fly back to Melbourne for the match. It was a case of planes, trams and taxis to get him to the ground, but in the end Australia beat Wales 27-19, and Berrick was declared man of the match. Archie Barnes is the third celebrity baby named Archie this year – the other two are Archie Whitely and Archie Johnson.